In my previous article on maintenance, I talked about the simple model I developed with a colleague around delivering effective maintenance support to an organisation. In this article, I’d like to expand on the key components of an effective maintenance organisation. Whilst this article is aimed at production facilities with a reasonable degree of complexity, the underlying principles hold true for smaller organisations, though in these cases, individuals will perform activity defined over multiple roles. Key throughout this is the fact that there is no such thing as the “right” maintenance organisation, it depends on too many factors that are unique to each organisation and production facility, not least the capability of the people in the organisation. This article sets out some underlying principles that should be applied when you design your maintenance structure. Some or all of these challenges will ring true with any maintenance professional, even if you are privileged to be a part of a high performing maintenance team. I have certainly experienced all of these first hand both as an engineering and as an operational manager. In many cases, these issues can be traced to a lack of capability or resource in key maintenance roles. Corrective maintenance execution – Too many organisations revel in capability in this area, and extoll the hero culture of the person who got the asset running again, without asking themselves why it broke in the first place. However, for many assets there is a need to have on-call maintenance support, waiting like a coiled spring, for an asset to fail so they can leap into action and restore operation. However, all too often, the maintenance cycle stops at this point and they focus on fixing symptoms not solving root causes. The corrective maintenance technician needs to be a jack of all trades, master of none and, in the increasingly automated world of modern production assets, will need a good understanding of the control environment and the automation systems in place. Of course, this resource needs to be scheduled to attend work when the asset is in planned production. Preventative maintenance execution – Once these resources are in place, assuming that the next two roles are able to support him, we now start to see the organisation moving from a reactive to a proactive culture. Technicians supporting in this area need to be subject matter experts in the assets they support, able to see beyond the immediate symptom of a failure, to the underlying issues that have caused an actual or potential failure. Unlike the corrective maintenance team, they need to be available when the asset is not scheduled to run. Where organisations attempt to deliver this activity with on-shift resource, this activity is either delivered badly or not at all, and the organisation never breaks out of the reactive cycle. Maintenance Planning – A greatly undervalued role by people who don’t understand maintenance. This is the role that ensures all the resources are working to peak efficiency, and are not hampered by a lack of spares, tools, resources and the like. The Maintenance Planner doesn’t spend his time sitting in front of the CMMS, he ensures alignment with operations and makes sure all the required tasks and resources are available to minimise the time the asset is shut down for planned work, maximising it’s availability to generate wealth. Maintenance Development – It is this role that defines the right maintenance strategy for the asset, taking into account its criticality, possible failure modes, resource availability and the asset owner’s attitude towards risk. This role defines the right balance of run to fail, scheduled replacement, scheduled inspection and condition based monitoring to ensure that the likelihood of a maintenance failure is reduced as close to zero as is economic, and that the impact of any maintenance related failure is minimised. This is the role that defines and develops the maintenance strategy. As discussed at the beginning, there is no such thing as a perfect maintenance organisation or an ideal structure. However, what you do develop needs to have the activity above built into the responsibilities of specific roles within the team. The balance of technician resource between shifts and days. An organisation with all the resource on shift will never break out of a reactive culture. Likewise an organisation that is unable to effectively plan and schedule it’s maintenance resource will never deliver a cost-effective maintenance function. 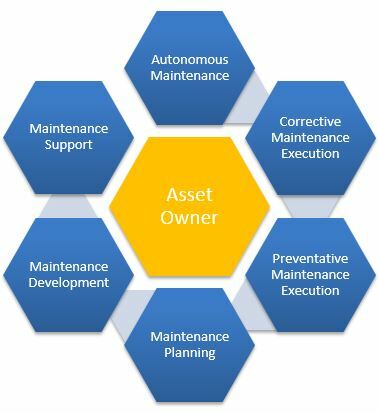 Most importantly, a maintenance team that does not put the asset owner at the heart of the maintenance strategy will never be truly aligned to the organisations strategy and will ultimately disappoint. We are all used to hearing about the Preventative Maintenance and Autonomous Maintenance pillars under TPM, but do they really help us identify what a maintenance organisation is here to deliver? Or, indeed, how to build a maintenance organisation from scratch? 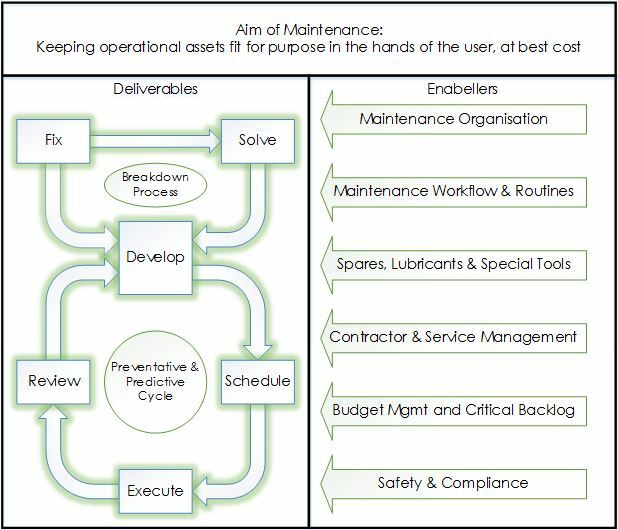 Many TPM programmes assume a level of capability within the maintenance organisation that is not able to be released, despite the best intentions of the maintenance team. What organisations need is to build basic maintenance capability first, so that future activity in the AM and PM arenas has a solid foundation to build upon. Early last year, a colleague and I were stranded at an airport waiting for a delayed flight, and, given that we were both maintenance engineers, we started to give some thought about what a maintenance organisation was for, what it delivered, and what supporting infrastructure it needed to deliver. Fortunately, despite the fact that we were separated from our laptops, we did have the back of a placemat to work on, so we set ourselves the challenge of capturing this on a single page. Maybe not perfect, and I’m sure it can be improved upon, but we have tested this in a number of environments – and it’s holding up so far! Maintenance Organisation – You achieve the results your organisation is designed to deliver. If all your technician resource is on shift, you will never break out of a reactive culture. If you have no maintenance planners, you will never effectively schedule tasks. If you have no maintenance development engineers, you will never understand the reasons for component failure and the actions required to mitigate these failures. If the asset owner is not at the heart of the process, you will never meet his needs or fully understand the operating context. Safety and Compliance – Maintenance work, through its non-routine nature, is more inherently hazardous that operating assets in their standard way. Control of work, risk assessment, permits, machine isolations are all fundamental parts of the maintenance professional’s task. All maintenance professionals should be involved. It is not a management activity. It is everyone’s activity.